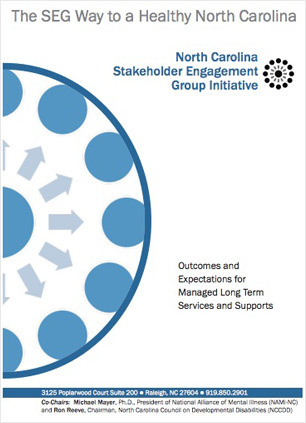 The NC Stakeholder Engagement Group (NC SEG) was a cross-disability advocacy initiative focusing on shaping the long-term support and service systems through meaningful engagement and dialogue with policymakers. It was generously funded by the North Carolina Council on Developmental Disabilities (NCCDD) for three years. Since the November election, the political landscape has changed rapidly and expansively, and we anticipate these changes will have a substantial impact on the long-term supports and service systems for people with disabilities. It is vital that the authentic, constructive voice of consumers and family members be at the table as the system evolves. The funding from NCCDD ended in November 2016. The NC SEG is currently looking for funding to continue its advocacy efforts. While we seek funding from a variety of sources, the formal activities of the group have been suspended. This page will be updated by Community Bridges Consulting Group pro bono until funding is secured. If you know of a funding source or possibility, please e-mail Kelly@cb-cg.com. Thank you! The NC Stakeholder Engagement Group (NC SEG) is a cross-disability advocacy initiative focusing on shaping the long-term support and service systems through meaningful engagement and dialogue with policymakers. We are currently the only group in North Carolina that consists solely of individuals receiving services and their family members. We want policymakers - leaders at DHHS, at Medicaid, and our state legislature - to know what is important to us! As plans are developed for consolidating LME/MCOs, medical care, and how we get services, we hope that these decision makers will seriously consider our recommendations; that they will carefully look at these outcomes and expectations, and discuss real ways to make improvements today and in the future to make these outcomes and expectations a reality. Stay informed! Subscribe to the Stakeholder Engagement Group mailing list! Endorse our Outcomes & Expectations Report! Few things are more effective in systems change than sharing a message and building a large network of support with established and respected groups or organizations. We are working to get as many supporters for the NC SEG’s Outcomes & Expectations as possible, and WE need your help! Are you a part of an organization that would be interested in endorsing the NC SEG’s Outcomes & Expectations? Let us know! We can provide you with the information you need and schedule an NC SEG representative to present to your group! E-mail info@ncseg.com for more information.